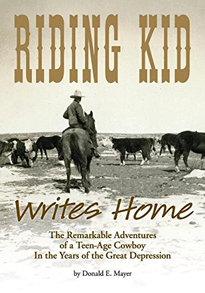 Former Bainbridge Islander Donald Mayer is the author of Riding Kid Writes Home: The Remarkable Adventures of a Teen-Age Cowboy In the Years of the Great Depression (2015). To write his memoir, Mayer draws on scores of letters sent to his mother after he ran away from his Depression-era home in St. Louis at age 14. His adventures include working at Texas cattle ranches, meeting Hollywood stars, scrubbing ship decks, and falling in love. Mayer is a splendid example of a generation described by Tom Brokaw as "the Greatest Generation - those who made it through the Great Depression, served victoriously in WWII, and returned home to build a prosperous America."